The conference conclusions were unwarranted due to broken or faulty weather instruments. Updated January 17, 2015. This article will quote and criticize findings about Martian weather that were released at a JPL news conference held on November 15, 2012. Text in black font is from the press release. Our comments will be indicated in colored fonts. ROFFMAN COMMENT: One trait is not enough to deduce a whirlwind/dust devil. Nor are two. See our discussion of Martian dust devils in Sections 1 to 1.2 of our Basic Report. Beyond this, what REMS shows on Figure 1 are pressure drops only on the order of 1 to 3 Pa (.01 to .03 Hpa/mbar). These small pressure drops should be compared with what is seen on Figure 3. Note that on Viking 1 Sol 332.3 pressure rose over 59 minutes by 0.62 mbar (62 Pa). Increases in pressure nearly that large (43 to 58 Pa) occurred on 15 successive days at Viking 1 almost the same exact time of day (see Figure 3 and VL-1 Sols 319 to 334 in our Basic Report). With Boom 1 broken on landing, wind direction and speed measurement made by MSL are quite dubious. In fact, after we harshly questioned JPL about never changing winds from the east at 2 meters per second from landing until the summer of 2013 they finally gave in and changed all winds for the entire mission to "not available." Their conclusions about detection of dust devils on this mission were therefore unwarranted. FIGURE 1 ABOVE: Signs of a Whirlwind in Gale Crater Twenty-one times during the first 12 weeks that NASA's Mars rover Curiosity worked on Mars, the rover's Rover Environmental Monitoring Station (REMS) detected brief dips in air pressure that could be caused by a passing whirlwind. The blue line in this chart shows two examples, both shortly after 11 a.m. local Mars time, when the air pressure dipped on the 75th Martian day, or sol, of the mission (Oct. 25, 2012). In both cases, wind direction monitored by REMS changed within a few seconds of the dip in pressure, as indicated by the green line on the chart. That is additional evidence that the pressure dips were whirlwinds. A Finnish, Spanish and American team is using REMS, which Spain provided for Curiosity, to watch for signs of dust devils -- whirlwinds carrying dust. In many regions of Mars, dust-devil tracks and shadows have been photographed from orbit, BUT THOSE VISUAL CLUES HAVE NOT BEEN SEEN AT GALE CRATER, where Curiosity is working. The evidence from REMS indicates that whirlwinds may be forming in Gale Crater. While Curiosity is watching for them with cameras on some days, researchers are also considering the possibility that these swirling, convective winds do not lift as much dust at Gale as in other parts of Mars. In this chart, the air-pressure scale is in Pascals. The wind direction scale is an estimate in degrees relative to the front of the rover. On Sol 75, the rover was facing approximately westward, and 90 degrees on this graph INDICATES WINDS COMING FROM THE NORTH. Image credit: NASA/JPL-Caltech/ CAB (CSIC-INTA). Figure 2 Above - Relative magnitude of 0.62 mbar increase in pressure for Viking 1 at its sol 332.3 and pressure drops or 79 convective vortices/dust devils at Mars pathfinder over its 83 sols. Dominant wind direction identified by REMS has surprised some researchers who expected slope effects to produce north-south winds. The rover is just north of a mountain called Mount Sharp. If air movement up and down the mountain's slope governed wind direction, dominant winds generally would be north-south. However, east-west winds appear to predominate. COMMENT: As we noted earlier, the word "dominant" is a misleading. There is never any wind correctly seen at MSL (with its lost wind boom). That’s why they had to retract their constant wind from the East at 2 m/s. This is highlighted on Figure 3. The rim of Gale Crater may be a factor. REMS monitoring of air pressure has tracked both a seasonal increase and a daily rhythm. Neither was unexpected, but the details improve understanding of atmospheric cycles on present-day Mars, which helps with estimating how the cycles may have operated in the past. COMMENT: Over 616 sols of weather examined as of May 4, 2014, every single time the pressure diverged from the expected curve, JPL altered the data to put it back on the curve. We document this starting at the fist slide on our PowerPoint and throughout our report and weather report for at least the first 616 sols. The seasonal increase results from tons of carbon dioxide, which had been frozen into a southern winter ice cap, eturning into the atmosphere as southern spring turns to summer. NEW COMMENT OF JANUARY 17, 2015: Although this is stated as fact, it is not yet proven. 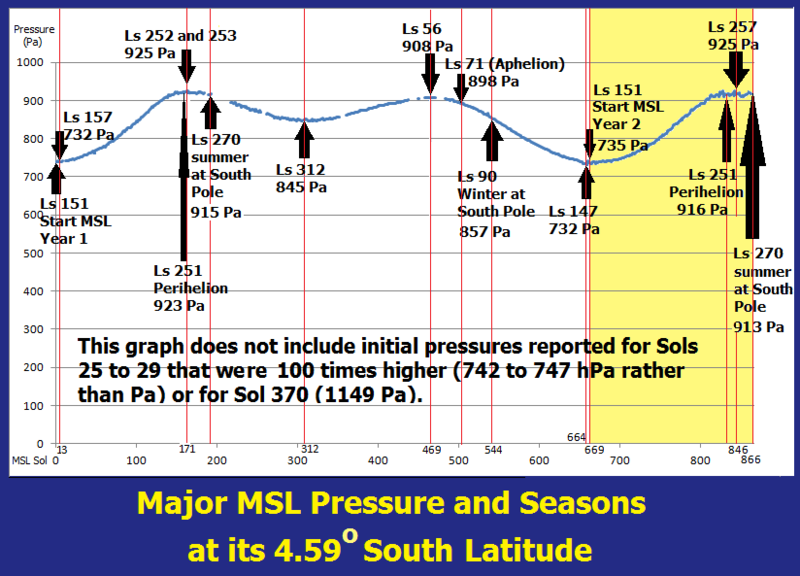 When looking at MSL pressures up through Sol 866 in January 2015, we note that although the maximum (revised) pressure at MSL for both MSL Year 1 and 2 was 925 Pa (Ls 252 to 253 in Year 1 and again at Ls 257 in Year 2), there was a spike that peaked at 908 Pa at Ls 56 in late fall. The 908 Pa figure is 98.16% of the late spring spike. The increase in pressure then would NOT be driven by frozen carbon dioxide at the southern ince cap returning to the atmosphere as gas, and the northern ice is largely or completely water ice - not enough to produce the 908 Pa pressure at Ls 56. See Figure 6 below and our article about MSL Year 2. The daily cycle of higher pressure in the morning and lower pressure in the evening results from daytime heating of the atmosphere by the sun. As morning works its way westward around the planet, so does a wave of heat-expanded atmosphere, known as a thermal tide. Effects of that atmospheric tide show up in data from Curiosity's Radiation Assessment Detector (RAD). This instrument monitors high-energy radiation considered to be a health risk to astronauts and a factor in whether microbes could survive on Mars' surface. COMMENT: We discuss RAD results here. "We see a definite pattern related to the daily thermal tides of the atmosphere," said RAD Principal Investigator Don Hassler of the Southwest Research Institute's Boulder, Colo., branch. "The atmosphere provides a level of shielding, and so charged-particle radiation is less when the atmosphere is thicker. Overall, Mars' atmosphere reduces the radiation dose compared to what we saw during the flight to Mars." For more information about Curiosity and its mission, visit: http://www.jpl.nasa.gov/msl , http://www.nasa.gov/msl and http://mars.jpl.nasa.gov/msl. You can follow the mission on Facebook and Twitter at: http://www.facebook.com/marscuriosity and http://www.twitter.com/marscuriosity. COMMENT: Guy Webster is a public relations man for JPL. He is, by his own admission, not trained in meteorology. Any questions sent to him will be redirected by him, likely through Dr. Ashwin Vasavada, to the REMS Team or Ashima, both of which have demonstrated a flawless pattern of ignoring all questions asked. As a result of their stance, and numerous flaws detected in their work, we attacked Ashima credibility on my site at Ashima/MIT Mars GCM. However, when the REMS Team altered a recorded (record) average daily pressure of 1149 Pa for Sol 370 to 865 Pa, the amount of pressure recorded for sol 369 (and supposedly for sol 371), to their credit Ashima did not follow their lead. In April 2014 Ashima still listed the pressure for sol 370 as 1149 Pa (essentially the maximum pressure that the pressure sensor could measure). FIGURE 3 BELOW SHOWS THE WEATHER REPORTS PUT OUT BY REMS AND ASHIMA FOR SOL 75. NOTE THAT THEY REPORTED THE WIND FROM THE EAST, NOT THE NORTH. REPORTS FROM REMS AND ASHIMA HAVE BEEN HIGHLY UNRELIABLE. FIGURE 5 (Adapted from JPL) - The overall increase in pressure between Sol 31 and Sol 93. JPL states, "The curves also show a strong daily variation in pressure of around 10 percent, with a peak near 7 a.m. on Mars and a minimum near 4 p.m."
Figure 6 - (Revised) MSL Pressures published by JPL and the REMS Team up through Sol 866.